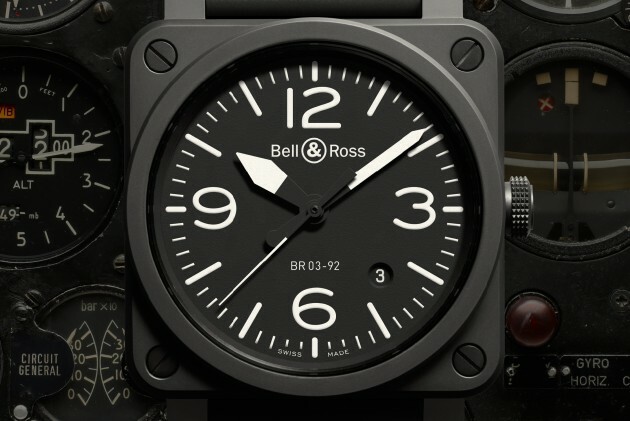 Bell & Ross’ iconic aviation collection welcomes a new member to the range. Stamping its modern vision on professional watchmaking, Bell & Ross enhanced the BR 03 instrument watch with a high-tech, hard-wearing material: ceramic. In aeronautics, and especially aerospace, ceramics are the material of choice for parts that must withstand extremely high temperatures, exposure to acids, corrosion and erosion. This is why ceramics are commonly found in thermal cladding or the nose cones of spacecrafts, and due to its bio-compatibility it is often found in the medical world, too. Bell & Ross has developed a specific manufacturing process which enhances the intrinsic qualities of the remarkable material, which resists scratching, does not fade, and weighs less than other materials such as steel. Ceramic is one of the hardest materials in the world, after diamond, making it resistant to wear and fading. Its unglazed color will stand the test of time. The material is also hypoallergenic, soft to the touch and immediately adapts to body temperature. The BR 03 Ceramic is built around the movement and its steel container protected by a shell, a cover and a ceramic case back. The eight screws visible on the outside of the ceramic case act like a clamp to seal the watch, guaranteeing its complete solidity and water resistance. As with any BR 03, this watch is high in legibility. The matte black finish of the 42 mm case, as found on aircraft instrument panels, optimises reading by preventing reflection. The sober design, black dial, large white numerals, shape of the hands and photoluminescent coating allow immediate reading of the time, both during the day and night. The all black Phantom watch is such a cool looking piece! Yaa… I’d rather a Breitling any day over this. Agreed. Not even worth the buy. Probably the only one who fancy this is those who really fly. but then again, those who did will incline more towards Sinn, Breitling, Omega and Damasko. Those are the real flying intrument, with real history and modern haute horlogerie. Better get Omega DSOTM (dark side of the moon) or better yet with 1/3 of the price get Sinn Testaf Ez10. Those are real instrument with no attitude of tyring to be what’s not.